This Australian ladybird is found in the North Island and Nelson in the South Island of New Zealand. It is an important predator of cottony cushion scale, Icerya purchasi Maskell, 1879 (Hemiptera: Monophlebidae) that was an important pest of citrus trees. The cardinal ladybird was first reported in New Zealand in 1889. 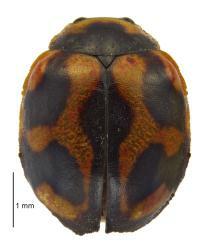 Subsequently there were additional releases of ladybirds collected in Australia. Conservation status: The cardinal ladybird is widespread and contributes to the biological control of cottony cushion scale, a pest of citrus and native trees. Female ladybirds lay oblong, red eggs singly or in groups on or near cottony cushion scale insects. A larva hatches from each egg. They are red and/or grey, and have long hairs (setae) on lateral tubercles of the abdomen. There is a small head. The three pairs of legs are used for walking. As the larva grows, it moults (changes skin). There are four larval instars (stages). The last instar is grey-brown with a dark head and four rows of dark tubercles. The lateral margin of the abdomen and thorax may be red. The lateral tubercles are prominent and bear long hairs. The legs are dark and the feet (tarsi) are covered in white hairs (setae). When the fourth larval instar is fully grown, it attaches itself to a sheltered place on a plant and moults into a pupa. The pupa, mostly enclosed by the larval skin, is covered in short setae and coloured shades of brown. Adults hatch from pupae and mate. The adults may stay in the pupal skin for a short time while their skin hardens. The length of time of each life stage depends on temperature, being shorter at higher temperatures. An early entomologist, Kirk, reported in 1894 that eggs took 5-7 days to hatch, the larval stage lasted 18-25 days and that the pupal stage took 8-9 days. It is reported to have 2.5 generations for each generation of its prey, Icerya purchasi (Hemiptera: Monophlebidae). Both adult and larval stages of the cardinal ladybird have three pairs of legs that can be used for walking. Adults have wings and can fly. The adult and larval ladybirds eat cottony cushion scale, Icerya purchasi (Hemiptera: Monophlebidae). They will burrow into the egg sacks of mature females pulling the white wax away to get to the eggs underneath. The jaws are the primarily structures used for holding and chewing the prey. Legs do not appear to be used for holding food. Adult cardinal ladybirds are usually red and black. The dorsal (top) side of the beetles are covered by short hairs which gives them a mat appearance. 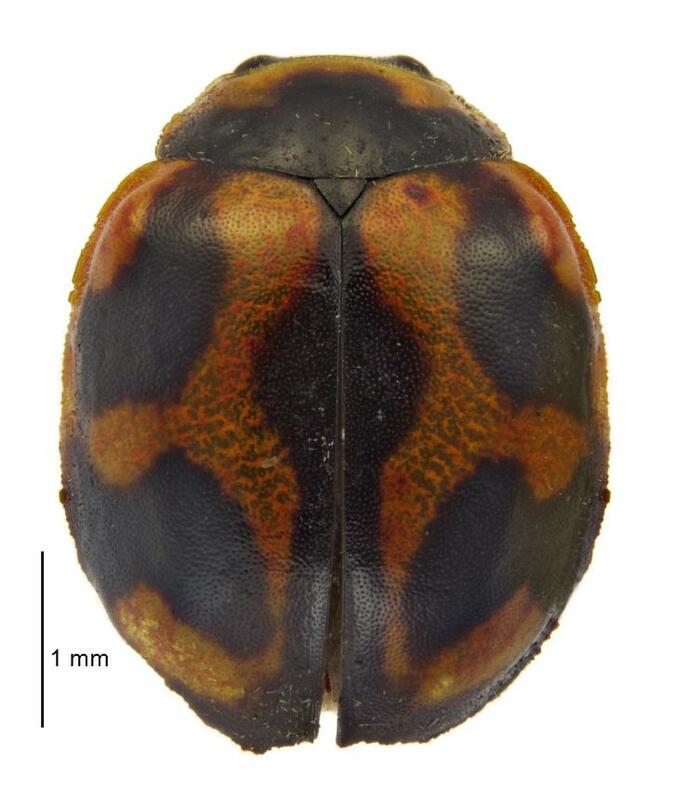 Koebele's ladybird, Rodolia koebelei (Coquillet, 1893), is also red and black and covered in fine hairs, but it has smaller areas of black and the elytra (wing covers) may be all red. Other red and black ladybirds have a glossy appearance. The larvae of both cardinal and Koebele's ladybirds have prominent lateral abdominal tubercles with many very long hairs (setae) and the lateral margin also have similar long hairs. They both may have an underlying red colour The cardinal ladybird larvae have four rows of dark tubercles. Mature larvae of Koebele's ladybird have two dark longitudinal bands and may be covered in white wax. No internet photographs of cardinal ladybird larvae show wax on larvae, prepupal larvae or on the larval skin surrounding the pupa. No natural enemies of the cardinal ladybird are known in New Zealand. They are probably preyed upon by birds, spiders and predatory insects. There is some evidence that the larvae will eat each other. In New Zealand the only known prey of the cardinal ladybird is the cottony cushion scale, Icerya purchasi Maskell, 1879 (Hemiptera: Monophlebidae). This ladybird is an important natural enemy of this scale insect, which if uncontrolled is a serious pest of citrus trees. In New Zealand, the cardinal ladybird is one of several natural enemies of cottony cushion scale that prevent this insect being a serious pest. Not all ladybirds eat insects; some feed on mites. Other species eat plant leaves and are pests especially in some tropical countries, whereas other ladybirds feed on fungi. One of these species, Illeis galbula (Mulsant, 1850), from Australia, feeds on powdery mildew fungi. In New Zealand it is common on pumpkins and other cucurbits, plants that are commonly infected by powdery mildews. A plant feeding ladybird, hadda beetle (Epilachna vigintioctopunctata (Fabricius, 1775)) recently established in Auckland feeds on plants in the Solanaceae (potato family). Bryant PJ. Vedalia Beetle, Rodolia cardinalis, Coleoptera: Coccinellidae. UCI Arboretum, University of California, Irvine, Irvine, Orange County, CA. 11/84. http://nathistoc.bio.uci.edu/coleopt/Rodolia.htm. (Accessed 2016 November). Good pictures of adults, larvae and pupae. Morales CF, Bain J 1989. Icerya purchasi Maskell, cottony cushion scale (Homoptera: Margarodidae). In: Cameron PJ, Hill RL, Bain J, Thomas WP ed. A Review of Biological Control of Invertebrate Pests and Weeds in New Zealand 1847 to 1987. Technical Communication No. 10. Wallinford, Oxon, UK, CAB International. Pp. 207-211. Slipinski A, Hastings A, Boyd B 2007. Ladybirds of Australia. http://www.ento.csiro.au/biology/ladybirds/ladybirds.htm . (Accessed 2011 April). Martin NA. 2016. Cardinal ladybird - Rodolia cardinalis. Interesting Insects and other Invertebrates. New Zealand Arthropod Factsheet Series Number 55. http://nzacfactsheets.landcareresearch.co.nz/Index.html. Date Accessed. ISSN 1179-643X.